Attached is the 2009 HOS LOU, this file include the orginal 09 letter as well as an updated clarification from 2016. Please take the time to look it over. This lays out how turnaround and flip service should be preformed. Engineers in this pool shall under normal conditions be confined to through freight service between St. Louis and Dexter and will not be inducted into other service off the Chester Sub which is not connected with pool freight service in that corridor. Hours of Service relief of trains operating St. Louis to Dexter may be protected by the extra board at Dexter if the train has reached lllmo or beyond. If the extra board is exhausted, an away-from-home engineer may be used and will thereafter either be deadheaded home or placed first out for service on his rest. Such trains which have not reached Illmo shall be protected on a straightaway move by a home terminal pool engineer at St. Louis. Hours of Service relief of trains in this pool operating from Dexter to St. Louis may be protected by the extra board at St. Louis if the train has reached lllmo or beyond; otherwise, a rested away-from-home terminal engineer at Dexter shall be used on a straightaway move to provide such relief. Hours of Service relief of trains in this pool operating from St. Louis to Jefferson City may be protected by the extra board at Jefferson City if the train has reached Hermann or beyond. If the extra board is exhausted, an away-from-home terminal engineer may be used and will thereafter either be deadheaded home or placed first out for service on their rest. Such trains which have not reached Hermann shall be protected on a straightaway move by a home terminal pool engineer at St. Louis, Hours of Service relief of trains in this pool operating from Jefferson City to St. Louis may be protected by the extra board at St. Louis if the train has reached Washington; otherwise, a rested away-from-home terminal engineer at Jefferson City shall be used on a straightaway move to provide such relief. 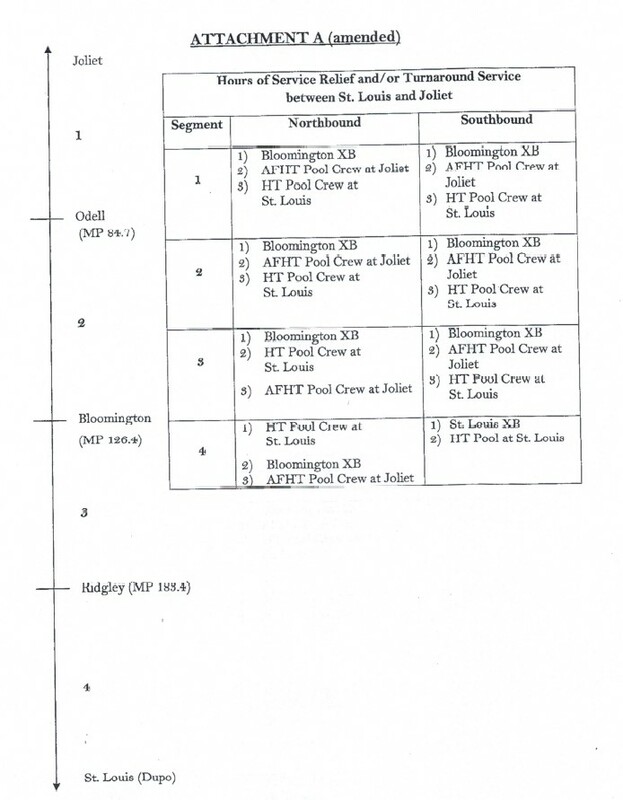 Hours of Service relief of trains operating St. Louis to Bloomington may be protected by the extra board at Bloomington, if in existence, if the train has reached Ridgley or beyond. If no extra board exists, such relief may be provided by a rested away-from-home engineer at Bloomington, who will thereafter either be deadheaded home or placed first out for service on their rest. Such trains which have not reached Ridgley shall be protected on a straightaway move by a home terminal pool engineer at St. Louis. Hours of Service relief of trains operating Bloomington to St. Louis may be protected by the extra board at St. Louis if the train has reached Ridgley or beyond; otherwise, a rested away-from-home engineer at Bloomington shall be used on a straightaway move to provide such relief. If none rested and available, the St. Louis Zone 2 extra board may be used beyond Ridgley. Hours of Service relief of trains operating St. Louis to S. Pekin may be protected by the extra board at S. Pekin, if in existence, if the train has reached Virden siding or beyond. If no extra board exists or it is exhausted, such relief may be provided by a rested away-from-home terminal engineer at S. Pekin, who will thereafter either be deadheaded home or placed first out for service on their rest. Such trains which have not reached Virden siding shall be protected on a straightaway move by a home terminal pool engineer at St. Louis. Hours of Service relief of trains operating S. Pekin to St. Louis may be protected by the extra board at St. Louis if the train has reached Virden siding or beyond; otherwise, a rested away-from-home engineer at S. Pekin shall be used on a straightaway move to provide such relief. If none rested and available, the St. Louis Zone 2 extra board may be used beyond Virden siding. Hours of Service relief of trains operating St. Louis to Villa Grove may be protected by the extra board at Villa Grove, if in existence, if the train has reached Findlay Junction or beyond. If no extra board exists or it is exhausted, such relief may be provided by a rested away-from-home terminal engineer at Villa Grove, who will there after either be deadheaded home or placed first out for service on their rest. Such trains which have not reached Findlay Junction shall be protected on a straightaway move by a home terminal pool engineer at St. Louis. Hours of Service relief of trains operating Villa Grove to St. Louis may be protected by the extra board at St. Louis if the train has reached Findlay Junction or beyond; otherwise, a rested away-from home engineer at Villa Grove shall be used on a straightaway move to provide such relief. If none rested and available, the St. Louis Zone 2 extra board may be used beyond Findlay Junction. If you are called and instructed to get your train within these limits there is no additional compensation, however if you are instructed to get your train outside of these limits there is an out of Limits claim you are entitled to. If you are called for Hours of Service Relief and the train within these limits, you are entitled to a Road/Yard Violation. If you try to take your 23 hour rest and the system does not allow it and/or CMS will not give it to you. Call your Local Chairman to get this fixed. The Extra Rest agreement is still in place. If you are looking for sample claim language click on claims at the top there is a copy of the claims book along with some sample language. At this time there is nothing to share, we are aware of what the S-TD Chairman are floating around their membership, at this time we are still negotating with the carier to keep everyone protected during the upcoming flodding. As soon as there is more information I will post it on the hub web site. The Past 24 hours the carrier has unilaterly cut 10 turns out of the C 015 RE04, this was not inline with the agreement and the turns are being placed back on the board the members are going to be restored to their turns. I am claiming a basic days pay, account being illegally displaced from the C 015 RE04 on (date) the board was properly regulated per the BLET Pool Regulation Agreement. File this claim and turn it in to your local chairman. If a manager is used to be a pilot for you on teritory you are unfamilar with, please get all of the details to your Local Chairman ASAP, Likewise you can email or text it to me. As most should already know, we are now allowed to use an agreed upon hand signal to obtain red zone protection. Safety Rule 81.5.4 is a Critical Rule. Some critical rules require violating a part of the rule, or something to happen before you can be charged with a violation. 81.5.4 does not have a qualifier, which means that not only not getting red zone protection can result in discipline, but even just not doing it properly can get you in trouble as well. This is why it is imperative to understand every part of the rule. When obtaining the red zone, it can be requested face to face, with an agreed upon hand signal, or over the radio. There are only two ways to confirm red zone protection. Either over the radio or whistle signal if a hand signal is used. It is important to note that it does say that you can confirm red zone protection has been established via face to face job briefing. Common sense would tell you that if I can request red zone face to face, I should be able to confirm protection has been established face to face, but the does not allow for this. This is the part of the rule that I hear a lot of different takes on. I have heard this two different ways from managers and crews. I’m not sure what the intent was, or if this overlooked with the change that came out. Rather than go by what the intent is, I highly recommends complying with what the rule says. Releasing red zone protection may be done by radio, agreed upon hand signal, or face to face. 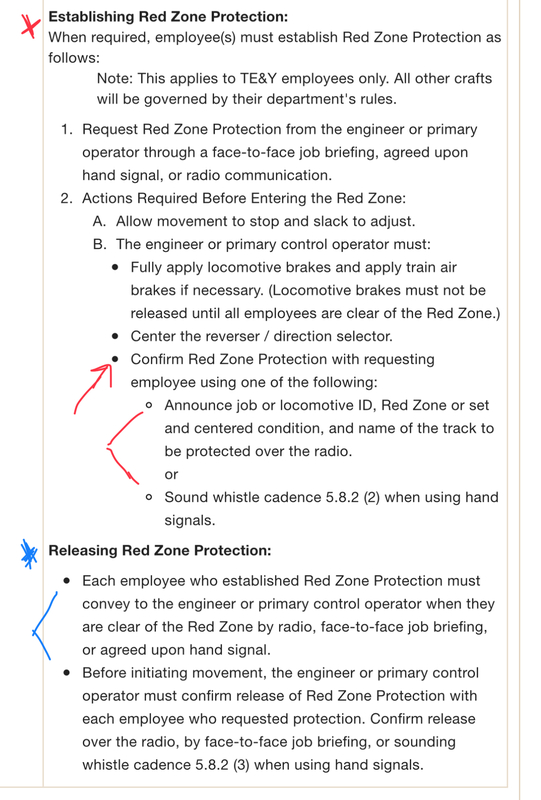 The engineer can confirm release red zone protection with the radio, whistle signal when using a hand signal, or face to face.